This electronic basketball game with mini hoops can handle 2 basketball players at a time and comes with 6 mini basketballs. This electronic basketball game even keeps score and gives you 30 seconds to make as many baskets as possible before the buzzer goes off. It has adjustable volume on the back and requires electricity to keep score and also requires at least 10 foot tall ceilings as the game itself is around 8 feet tall. Pop a shot basketball carnival games are always a big hit and can be used at sports themed parties or company picnics as an activity for kids or adults. Mini basketball games can be used as a team building activity or sports challenge between guests or employees. We are a carnival and amusement game rental superstore serving all of Colorado with electronic basketball games and activities for kids and family events. 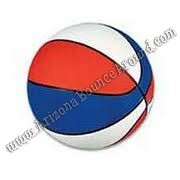 We also rent bigger inflatable version of this game, professional basketball hoop rentals and games to dunk basketballs. This electronic basketball pop a shot hoop game price includes standard set up if rented with inflatables. Standard setup is considered an area within 80 feet of sufficient electrical supply. Delivery and removal within included delivery area with no restrictions for delivery, set up or pickup. If you are renting this game only delivery and pickup will be additional.